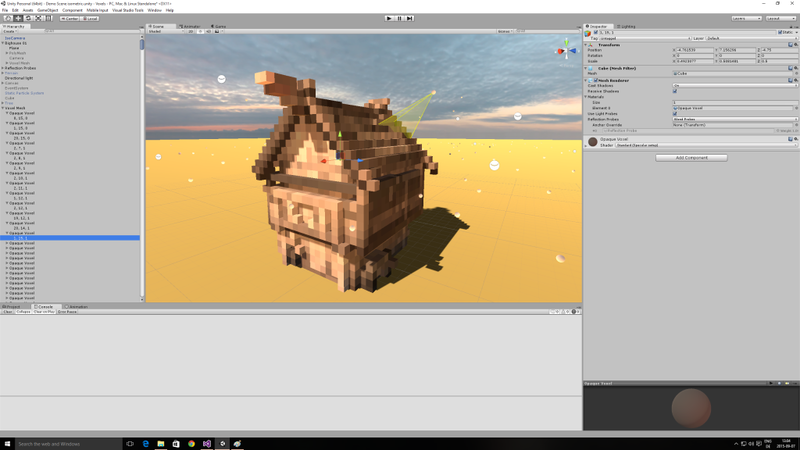 “Voxels” is being published as an extension to the Unity runtime and editor via the Asset Store. Its purpose is to scan existing graphics for its colors or materials and store those into a three-dimensional data structure. Those scanned cells can be called “volume pixels”, or voxels for short, and are being transferred to processor classes. Two types of processors are included in the release package. The first one constructs a hierarchy of game objects from the incoming data and attaches a specified mesh, a renderer and a material to every of its objects. 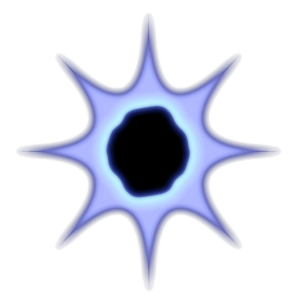 The material is instantiated using a standard shader or a given template and modulated by the sampled color data of the individual cell. An optimization can be enabled to merge multiple voxels that share the same material into single meshes. And the second processor is able to store the voxel data into a particle system, which is also instantiated by a given one. Because there is a very simple programming interface it is easy to write own scripts, which are building other game objects, passing the voxels to volume textures, converting the data for (existing) scripts respectively plug-ins or even exporting them to be used outside of Unity. You can use the two included processor classes as blueprints for your own efforts. But you can also stay away from programming and only utilize the user interface of the components to create appealing voxel graphics. The conversion can be done in the edit mode and while the game or application is running. It is also possible to mix inspector adjustments and scripting. For example you set up converter and processor properties in the editor but the operation will only be started when an event in the game like loading a level occurs. The scanning process works by rendering the desired items in slices to off-screen buffers, which are being copied to main memory afterwards. Whenever a pixel is set, its color is added to a cell in an octree. Later the colors are being combined per cell using mathematical operations or a more complex algorithm for the most frequent color method. That way source materials, lights and shaders remain intact and you get a result comparable to the original, if the settings are right. And this solution is the unique feature of the tool because other, existing extensions are using the ray casting methods provided by Unity. Those methods do not perceive vertex transformations by the shader or material computations per pixel. Further on you can also create results that only resample the shape of the basis but contain total different surfaces and appear as holograms, dust clouds, artistic effects and so on. Another option is the ability to animate voxels, e.g. for detonating 3D models or transforming between different ones. Unfortunately not everything works the way it has been planned. Shadow maps seem to become effectless and particle systems are culled in the scanning process because of the near depth clipping planes. Up to now no options could be found to prompt Unity to use other clipping values for shadow map creation or not to hide specific objects while rendering. But I am still looking for answers. Moreover I want to include new features into upcoming versions. Some will help to make the conversion more powerful, others may handle the results in various directions.